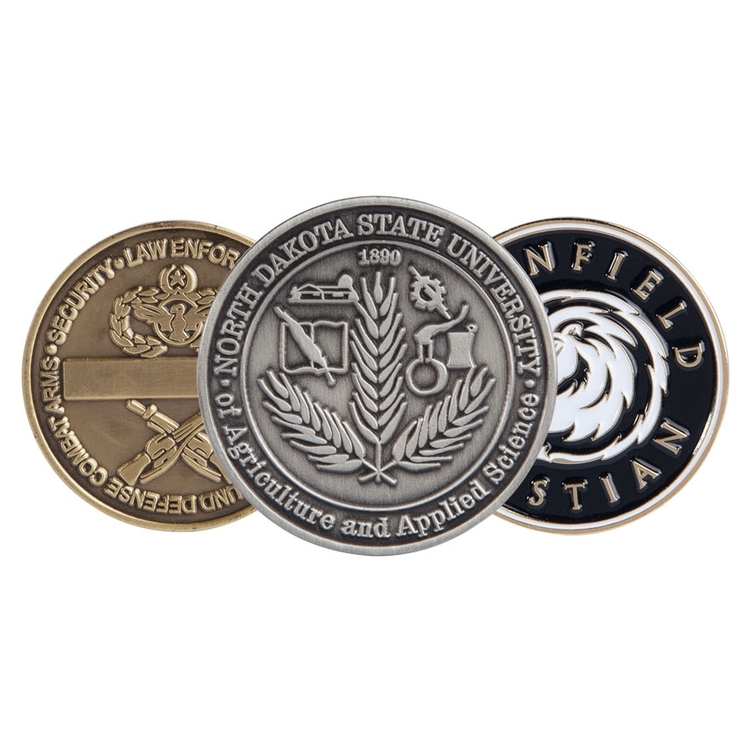 Zinc coins are our most popular and economical coin, rivaling the quality of a Brass Coin at a lighter weight. Challenge coins originated during World War I. They were issued to battalions as symbols of camaraderie and unity. Later, they were used as a way of verifying membership in a club, group or military unit. Challenge coins are now commonly given away at military and DOD meetings as a token of appreciation or as a promotional product. Price Includes: Choice of Plating for Gold or Nickel (Copper, Dyed Black, Antique Gold, Antique Silver, Antique Copper all additional cost), Choice of Edge for Flat or Rope Edge (Flat Weave, Oblique Line, Cross Cut, Petal Cut and Reed Edge at additional cost), Up to 4 colors on one side, Digital Proof.